Osmocote Pro High K 8-9M granules are fully coated and contain NPK, Magnesium and all necessary trace elements. It has contains high amounts of potassium. 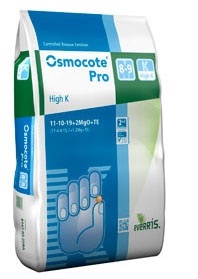 Osmocote Pro High K 8-9M has a predetermined longevity and can be used in a wide variety of growing situations.